Marinco's FullBlast compressor driven air horns are the loudest and most complete line of 12V air horns available. 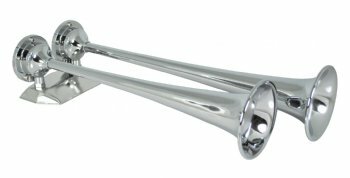 All of our air horns produce sound levels ranging between 120 and 127dB, which means all of our air horns meet the ABYC and NMMA regulations for boats up to 20 meters/66 feet. Both 12 and 24 volt compressors are CE listed.